Alessandro Bacci's Middle East: Kuwait’s Petroleum Sector: What Is the Right Strategy? Kuwait’s Petroleum Sector: What Is the Right Strategy? The analysis “Kuwait’s Petroleum Sector: What Is the Right Strategy?” has been written for the 5th Kuwait Oil and Gas Summit, which is organized by The C.W.C. Group, an energy and infrastructure conference, exhibition and training company. 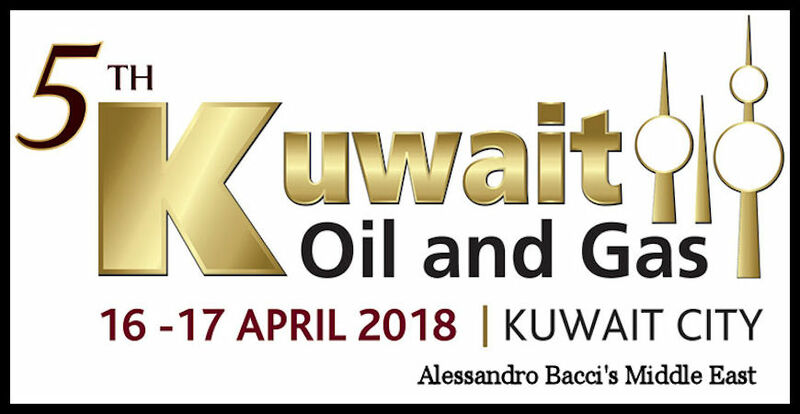 The 5th Kuwait Oil and Gas Summit will take place in Kuwait City, on April 16-17, 2018. With 101.5 billion barrels of oil (BP Statistical Review of World Energy 2017), Kuwait owns the world’s seventh largest proven oil reserves, or 5.9% of the world’s proven oil reserves. The country’s economy is dominated by the oil sector. In fact, more than 50% of the G.D.P, 92% of export revenues (from oil and oil products and fertilizers), and 90% of the government income come all from the oil sector (C.I.A. World Factbook, 2018). With reference to natural gas, Kuwait, with 1.8 trillion cubic meters (Tcm) of natural gas (BP Statistical Review of World Energy 2017), on par with Norway and Egypt, owns the world’s 16th largest proven natural gas reserves, or 1.0% of the world’s proven natural gas reserves. Kuwait has a production capacity of about 3.1 million barrels per day (MMb/d) and an effective production of about 2.7 MMb/d. 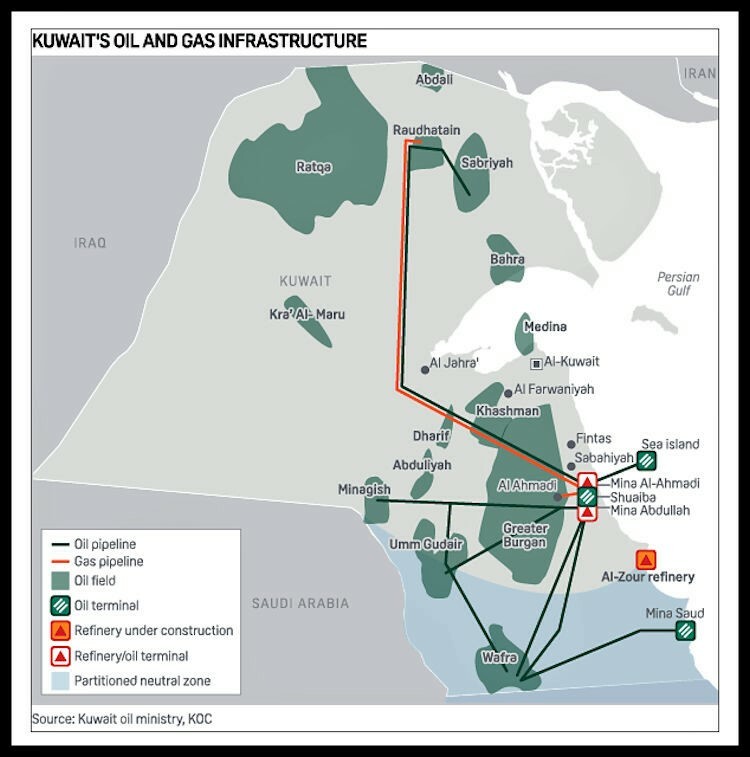 Kuwait’s production of about 250,000 b/d at the Wafra (onshore) and Khafji (offshore) fields in the Partitioned Neutral Zone, which is the border region between Kuwait and Saudi Arabia, has been shut down since 2015. 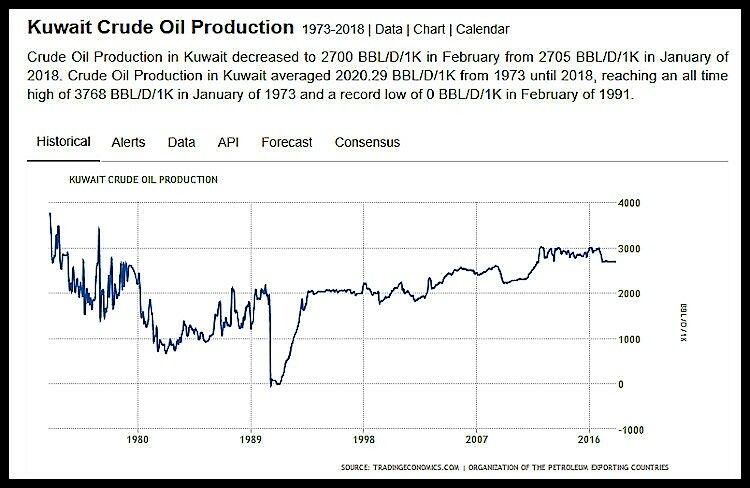 At the current rate of production, Kuwait’s oil should last for almost 88 years, while gas reserves for more than 100 years. Kuwait, as well as the other Persian Gulf producers, has a couple of important advantages: very low production costs and a geographic position at the crossroads of three continents (Europe, Africa, and Asia), which permits Kuwait to easily export oil and oil products to more than one market. Kuwait has production costs among the lowest in the world. In fact, it has had until now production costs of about $8.50 per barrel on average (in specific, $3.70 for capital expenditures and $4.80 for operating expenditures). Probably, these production costs will relatively rise in the future because production will derive from more complex fields. However, because oil is a commodity (despite different A.P.I. degrees and sulfur content), low production costs are one of the most important commercial advantages for an oil producer. At the same time, thanks to its geographic position, Kuwait may easily export its oil to the Asia-Pacific region, which receives about 80% of its oil exports (Kuwait’s overall exports are estimated at about 2.0 MMb/d). Crude oil is primarily sold on term contracts, and its crude oil exports have been until recently a single blend of all the Kuwaiti types of crudes, which is called ‘Kuwait.’ This blend has 30.5 A.P.I. 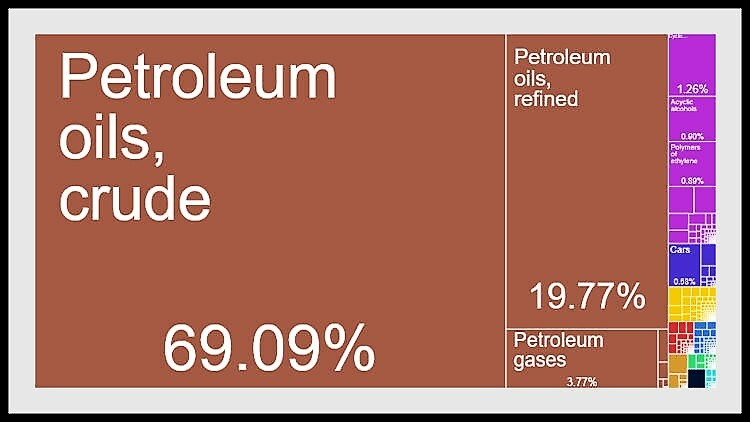 degrees and 2.6% of sulfur content (it’s defined a sour crude). Presently, with the help of some Asian refiners, Kuwait is testing in Asia whether there might be some interest in a new Kuwaiti blend called ‘Super Light,’ which has an A.P.I. gravity of 48 degrees and 0.4% of sulfur content. In addition, in August 2018, Kuwait wants to launch the blend ‘Kuwait Heavy,’ which has an A.P.I. gravity of 16 degrees and 4.9% of sulfur content. So, Kuwait represents a reliable and secure oil producer, which has been in the oil business since 1938 when oil was discovered four years after the signature of the concession in favor of a joint venture between Anglo-Persian Oil Company (today’s British Petroleum) and Gulf Oil (today part of the U.S. company Chevron). And, for all these decades, apart for a short hiatus linked to the invasion of Kuwait by Iraq’s army, Kuwait has been one of the world’s most important and reliable producers. However, because of the evolving energy scenarios linked primarily to geopolitical considerations, disruptive technologies, and climate change goals, it has become more difficult for a petroleum-producing country to understand the future opportunities and challenges concerning the petroleum sector. In practice, the petroleum industry is in transformation, and all the petroleum-producing countries (but, it would be more correct to add all the petroleum-importing countries as well) must learn how to mitigate the present uncertainties. And, as a producer, Kuwait is not exempt from this difficult challenge. In addition, these uncertainties regarding the development of the world’s petroleum industry are added in Kuwait to an economy that is completely dependent on the sales of oil and oil products. In fact, despite some attempts, Kuwait has not succeeded in diversifying its economy and in supporting the development of the private sector. The public sector employs about 74% of the citizens. Be it clear that these economic features are quite widespread among all the Persian Gulf producers (neighboring Iraq is experiencing the same economic problems in addition to high costs linked to the reconstruction after the ISIS insurgence). The level of a country’s petroleum dependence can be measured according to several different methodologies. In any case, three good indicators may be: petroleum activities representing a sizable share of G.D.P., petroleum rents representing a sizable share of G.D.P., and petroleum exports representing a sizable share of the merchandising exports. In brief, Kuwait has high values in relation to all these three indicators. The government had passed its first long-term economic development plan in 2010. The idea was to spend up $104 billion over just four years with the specific goal of diversifying the economy, bringing investments in Kuwait, and increasing the private-sector share of the economy. Many of these projects never materialized because of the uncertain political situation and the delays in awarding the contracts. In Kuwait, diversification is not happening primarily for two reasons. First, because it’s never an easy task to diversify the economy of a commodity-producing country. And this is true no matter in what part of the world we are. Also, for a country like Norway, which is normally considered the model of a successful petroleum-producing country, diversifying the economy (although not completely) has not been an easy task, and several specific (of the Norwegian state) factors helped Norway reach this goal. In fact, for a commodity producer, there is always, behind the corner, the risk of facing two dangerous phenomena, i.e., the Resource Curse and the Dutch Disease. Second, diversification is not happening in Kuwait because of the difficult relationships between the National Assembly, on the one side, and the executive branch, on the other side. Historically, in Kuwait, the relationships between these two institutional bodies have never been simple, and they have stymied many economic reforms proposed over the years. A strong confrontation between the National Assembly and government concerning the way to deal with the management of the natural resources according to the interpretation of the text of the Constitution had already materialized in the 1960s. However, many petroleum-producing countries find themselves in dire financial straits after an oil’s price fall, as it occurred in 2014. So, if a country’s economy is based on just a single pillar, when this pillar is not any longer stable, there are bad economic consequences for the country. In practice, a single-pillar economy has lower resilience against shocks affecting its single pillar than the resilience of an economy based on several different pillars. And this is what exactly occurred to Kuwait. The adage ‘never put all the eggs in a single basket’ is true for private investors as it is for countries. In fact, in 2015, for the first time in 15 years, Kuwait realized a budget deficit. The following year, the deficit increased to 16.5% of the G.D.P. Then, in 2017, the deficit decreased to 7.2%. At the same time, the government issued $8 billion’s worth of international bonds—there is a trend in this direction in the Gulf Cooperation Council (G.C.C.) region. Kuwait’s Fund for Future Generations, the sovereign wealth fund, in which each year Kuwait saves at least 10% of government revenues, helped cushion Kuwait against the impact of the reduction in the oil prices. Without capital expenditures and social allowances, the latter make up two thirds of the private sector salaries, the economy would have slowed more consistently. Considering the above points, it appears clear that Kuwait’s overall economic development must pass through the diversification of the economy and a boost in private-sector hiring. However, as economic literature has well explained, this is easier said than done, especially in a country subject to harsh weather conditions as Kuwait is. Probably, the best route would be the development of industrial clusters linked to Kuwait’s characteristics and not a top-down industrial policy established by the government. So, branching out to other industrial sectors according to a cluster logic may be the correct way. Kuwait might be the location for clusters related to technologies linked to living in hot environments. For instance, technologies linked to water desalinization, solar energy, and agriculture in arid lands. Instead, with reference to the petroleum sector, the correct strategy, despite all the present uncertainties, must be continuity with the past. Here the logic must be to understand what Kuwait can and cannot do now and in the next years. In fact, notwithstanding all the ongoing discussions, it’s impossible for Kuwait not to rely on the revenues deriving from the sale of oil, which has been for the last decades and will continue to be, at least in the near future, the country’s most important asset. As of today, without oil revenues, numbers tell us that Kuwait’s economy would come to a grinding halt. Plus, it’s important to understand that diversifying the economy would take years before making a dent on the current structure of Kuwait’s economy, which is dependent on the export of oil and oil products. In 1997, Kuwait formulated ‘Project Kuwait,’ at that time a $7 billion 25-year plan having the goal of increasing the country’s oil production capacity (and compensate for the decline at the supergiant Burgan field) with the help of international oil companies (I.O.C.s). In specific, Kuwait wanted to initially increase output at five northern oil fields—Abdali, Bahra, Ratqa, Raudhatain, and Sabriya—from a production rate of about 650,000 b/d to 900,000 b/d within the following three years. Then in mid-2000s, the basic idea of the project became to increase the country’s oil production capacity to 4.0 MMb/d by 2020. This whole project has not materialized until now despite the authorities have always reaffirmed until recently that this is still an achievable target. The main reason for the delay is the political opposition to the I.O.C.s and to the contractual structure offered to them. Many of the new projects have faced relevant delays because of the National Assembly’s opposition to the envisaged new contractual structure. For more information about Kuwait’s petroleum contracts, please see: BACCI, A., Kuwait's Oil and Gas Contractual Framework and the Development of a Modern Natural Gas Industry (Dec. 2011). In brief, in order to bring in Kuwait the I.O.C.s, at the end of the 2000s, Kuwait started to offer Enhanced Technical Service Agreements (E.T.S.A.s), which allow the foreign companies to provide technical expertise (needed especially for the more challenging fields) and management expertise for a fee. Kuwait’s politicians have always been quite skeptical about the transparency of the E.T.S.A.s and whether what Kuwait receives in exchange for these services is fair. In any case, in the past ten years, Kuwait has signed some E.T.S.A.s with Shell, BP, and Total, although the development of the contracts has been marred by several missed deadlines. 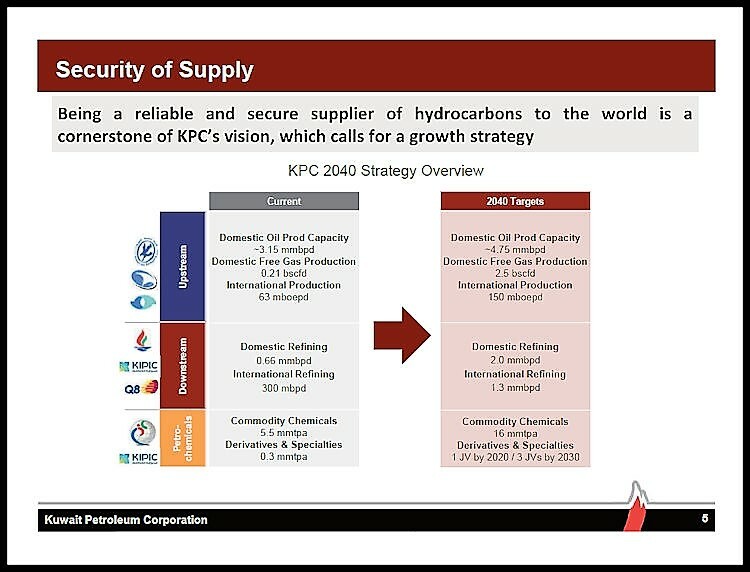 Kuwait won’t probably achieve the target of 4 MMb/d by 2020, but Kuwait Petroleum Corporation (K.P.C.) has recently affirmed that it intends to invest more than $500 billion to push its petroleum production to 4.75 MMb/d by 2040. Whether the 4.75 MMb/d target includes Kuwait's production from the neutral zone is not clear. In any case, this increase will derive mostly from northern Kuwait, which is currently producing 1 MMb/d. In specific, the company should spend $114 billion in capital expenditures over the next five years and additional $394 billion after the initial five years up to 2040. In practice, although the petroleum market has changed consistently over the past 10 years, Kuwait proposes again an oil-production expansion plan. And, despite that Kuwait is subject to OPEC quotas and that OPEC and non-OPEC members are currently restraining their crude oil production to support oil prices, there is a logic behind this choice. And Kuwait is not the only country carrying out this type of plan. In fact, throughout the Persian Gulf oil-producing countries, there is a medium-term trend toward expanding crude oil production (see for instance the expansion plans relating to Iraq and Iran as well). With reference to oil, all these countries share the same advantages that Kuwait has, i.e., low crude-oil production costs and an interesting geographic position capable of serving more than one market (the favored one is the Asian market now). And because oil is a commodity (let’s put aside the differences relating to A.P.I. degrees and sulfur content) and considering the two above-mentioned advantages, if oil markets were not affected by distortive political and economic barriers, it would be evident that the most obvious oil producers in the world should always be the Persian Gulf producers and Russia as well. Think of David Ricardo’s theory of comparative advantage. So, summing up, this medium-term trend tells us that these countries, including Kuwait, are betting on cashing in on these two mentioned advantages, if not today, on a medium-term horizon. What Kuwait is slowly trying to achieve is probably the correct strategy under the present uncertain circumstances. In any case, selling oil and oil products will require a more detailed attention to the whole petroleum chain, from upstream to downstream. In fact, competition among producers is increasing both at the regional and at the international level with the specific goal of capturing opportunities in the market. For sure, Kuwait is well positioned to take advantage of the growing oil demand occurring in Asia, but this is true for all the other Persian Gulf producers as well, and it seems that in the future also oil producers from other geographic areas might try to sell oil in Asia. For Kuwait, enhancing customer relationships will be crucial to maintain prearranged fixed sales agreements, which guarantee a certain cash flow. Because oil is a commodity, differentiation strategies are not easy to implement. One route might be to have an enlarged role in relation to oil trading. At the same time, Kuwait must necessarily continue to increase its production of non-associated natural gas; its associated natural gas production makes up 80% of the total natural gas production. According to BP Statistical Review of World Energy 2017, Kuwait in 2016 produced 17.1 billion cubic meters (Bcm) of natural gas, while it consumed 21.9 Bcm. The goal is to increase non-associated gas production to 2.5 billion cubic feet a day (Bcf/d) in 2040 from the level of 0.5 Bcf/d in mid-2018. Kuwait needs large supplies of natural gas to generate electricity and to carry out water desalination, petrochemical production, and enhanced oil recovery to boost oil production. In specific, the electricity sector often fails to generate enough electricity to meet peak demand. Moreover, because Kuwait for a good share produces electricity by burning oil and other liquids, which in this way are not exported, Kuwait is currently losing revenues from the missed sales of this oil and other liquids. More domestic natural gas production from non-associated gas fields might free some quantities of oil for export with consequently the result of increasing the revenues for Kuwait. The need to increase natural gas availability is quite urgent because domestic energy demand is going to double between 2017 and 2030. Kuwait has been relying on L.N.G. imports since 2009 when natural gas consumption overpassed domestic production, and this trend seems not to abase. In December 2017, K.P.C. signed a 15-year L.N.G. gas import deal with Shell (the deal will start in 2020) to help Kuwait to continue to close the gap between its gas demand and its gas production. At the end of the 2000s, the country started to develop, although slowly, its non-associated gas reserves, primarily from the Jurassic non-associated gas field (technically quite challenging) in norther Kuwait. This field was discovered in 2006 and has 35 Tcf of estimated reserves. In 2017, the government approved the second phase of the North Kuwait Jurassic Gas project, and, finally, this year three early production facilities, Sabriya and Umm Niqa fields, East Raudhatain field, and West Raudhatain field are coming online. Together, these facilities will produce 200,000 b/d of light crude and 500 MMcf/d of natural gas.